Paul Mathisen, director of sustainability and associate professor of civil and environmental engineering, gathers community input during a kickoff event for the next sustainability plan. WPI’s Office of Sustainability is collecting campus-wide input to develop WPI’s next sustainability plan. 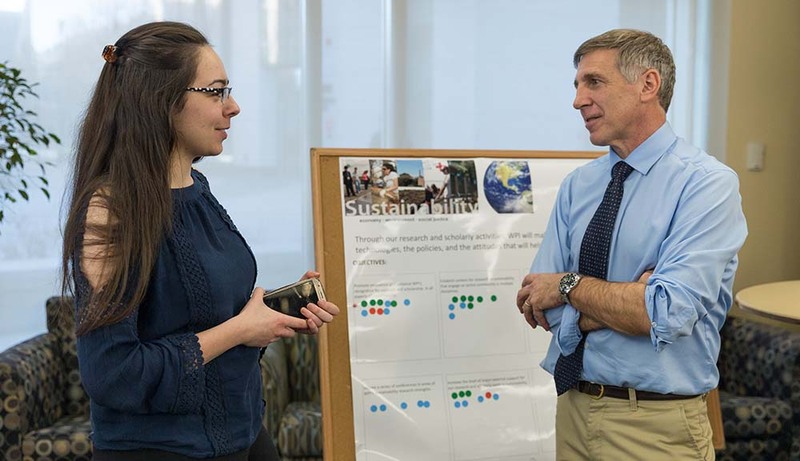 A sustainability planning kickoff event was held last month to jump-start this effort, with students and other members of the WPI community offering some ideas on how to improve on the university’s efforts to make the community more sustainable as a new 5-year plan is drawn up. Since it addresses all three pillars of sustainability (environmental, social, and economic), the team says broad participation is important. Paul Mathisen, director of sustainability and associate professor of civil and environmental engineering, said sustainability is ingrained throughout WPI’s programs and mission. “The development of this plan provides an opportunity to bring the community together to help us further our goals and initiatives in this area,” he said. Executive vice president and CFO Jeffrey Solomon noted that WPI has already completed numerous initiatives that align with the plan’s goals, including reduced energy consumption initiatives; construction of two additional LEED-certified buildings on campus; establishment of a Green Revolving Fund; development of a greenhouse gas reduction plan; and launch of a minors program in sustainability engineering. WPI’s sustainability plan serves as the university’s roadmap for long-term planning around which academic, research, community engagement, and operations sustainability initiatives are developed. He added that three working groups in the areas of facilities and operations, academics and research, and community engagement are being formed, which will take the prioritized objectives, refine them, and identify tasks that can help to achieve the objectives. Students complete a survey about WPI's sustainability plan during a recent event. Students, staff, and faculty are invited to join these working groups; they're also encouraged to provide input on the objectives and topic areas by voting on the objectives they consider to be priorities. Additional opportunities for input will be provided throughout the year ahead. WPI graduate student Rajendra Kante, majoring in data science, said he attended the kickoff event because he wants to help contribute to saving the planet through electricity, heat, and water conservation. Chemical engineering major Maya Sun ‘21 agreed that the plan should promote waste reduction by students. She is a member of the Green Team and an intern in the Office of Sustainability. Kyle Corry ’20, a computer science major who is president of the Green Team and vice president of Students for a Just and Stable Future, also spoke at the event. He emphasized the importance of student involvement, and pointed out that impacts of WPI’s sustainability decisions are something students can see firsthand. “When I came here, I saw that WPI was a sustainable school with an innovative face that challenges people who are willing to do it and make changes,” he said. In order to solicit campus involvement in the university’s Sustainability Plan, a World Café will be held at the Goat’s Head Pub on Feb. 13 from 8 to 11 a.m. The event will have small groups brainstorm with the assistance of facilitators to develop objectives for the plan. To learn more or register, please email gr-green@wpi.edu.